New CL user login Capcha with pictures make me really really angry. I spent 10(!) minutes to login because trying to find "images with cars". May be I am an idiot with PhD. My opinion it is totally wrong, overkill. I hate this, it makes me sick to know that I also pay for this! Please, give user setting/option to skip it. Thanks. Sorry about that! We were experiencing some spammers posting junk and the captcha seems to have stopped them for the moment. 1) For most users, the Google-powered captcha lets them skip the "images with cars" step entirely because it already "knows" they're a human rather than a spambot. 2) Can you just stay logged in all the time? That way you should only have to see it very, very infrequently. Mike, thank you for very kind response to my rather emotional post. On some computers I have to login every time because of security policies. I would keep this capcha only for process of opening new accounts. And for at least all paid accounts I would suggest to offer account setting to disable this capcha. This seems fair to me. :) Thanks. +1 the captcha is hyper annoying. I stay logged in but where it still trips me up is that I create lots of circuilts, and then delete them. Why in the F does deleting a circuit require going through the capcha??? I'm already logged in for chrissake. 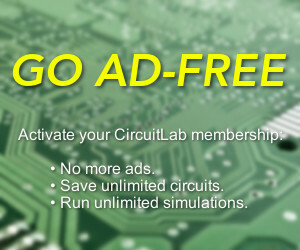 CircuitLab Forum Guidelines Be nice! Make everyone feel welcome to participate in the conversation. Be constructive! Assume and demonstrate good faith. Take a tone of actionable, professional, and courteous suggestions. Be specific! When applicable, make your circuit public and include it with your post, or include a screenshot or photo of your project. Same problems with Captcha! If there is no change in corporate politics I will not extend my subscription.